An out-take from my recent article about the Muslim music market demands a separate post. In 1989 the Tunisian director and actor Fadhel Jaziri created the music spectacle Hadhra celebrating the eponymous ecstatic Sufi ritual of possession. The original production had a cast of 480 with no less than fifteen bendir (frame drum) players and lasted for 90 minutes. The scoring is for oboe, saxophone, three violins, string bass, electric guitars, two synths, ney (reed flute), percussion, and, of course, multiple bendirs. There is some poor quality video of the original production on YouTube, and a double CD was released in 2000 but is now deleted and fetching a premium online. 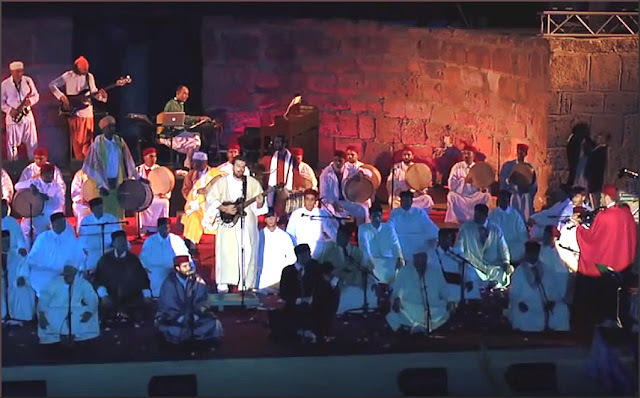 Fortunately the revival of Hadhra with smaller forces for the 2013 Festival International de Carthage in Tunisia seen above was captured on high quality video. Anyone still labouring under the misapprehension that music is forbidden by Islam should watch the clip below of the Sufi equivalent of Jesus Christ Superstar.